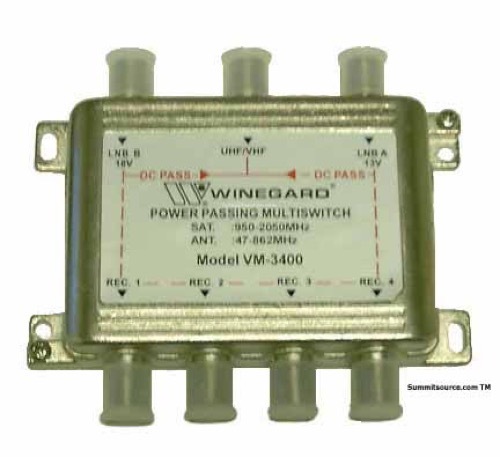 The Winegard VM-3400 Multi-Switch is ideally suited for multiple Satellite receiver installations for home or small commercial applications. Equipped with 2 Satellite inputs, Off-Air Antenna input and 4 Satellite receiver outputs, this unit is a "power-passing" multi-switch providing a regulated 12 volts DC to the Off-Air input to power an antenna pre-amplifier. The VM-3400 also eliminates the need for a separate diplexer and is equipped with an internal amplifier to compensate for insertion loss. This unit can be powered from any of the 4 Satellite receiver outputs making this unit extremely versatile and cost effective by eliminating the requirement for an external power source.